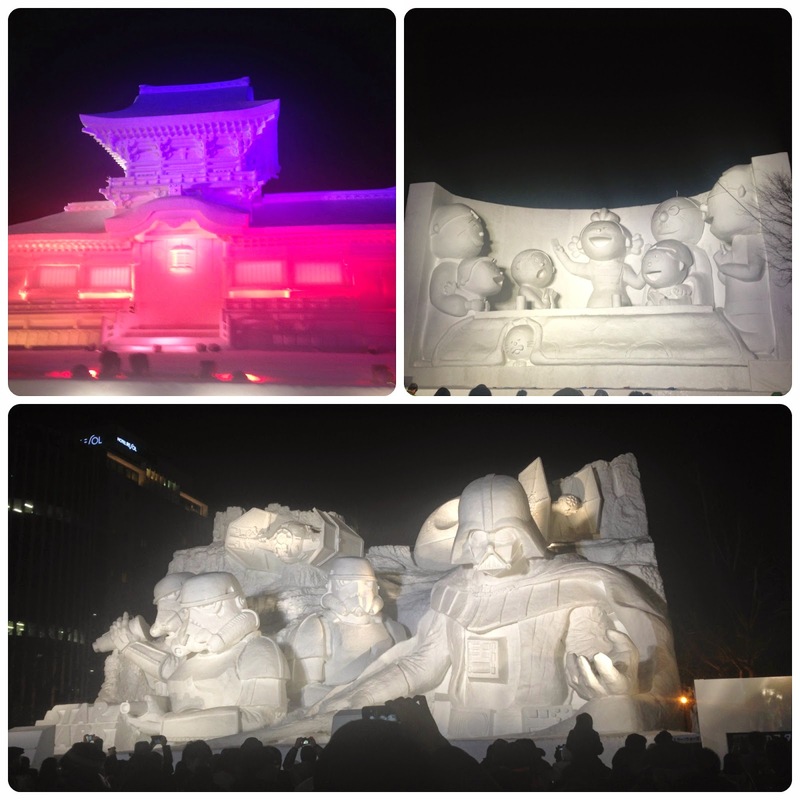 Portmanteau Suitcase: Sapporo Snow Festival/Yuki Matsuri! 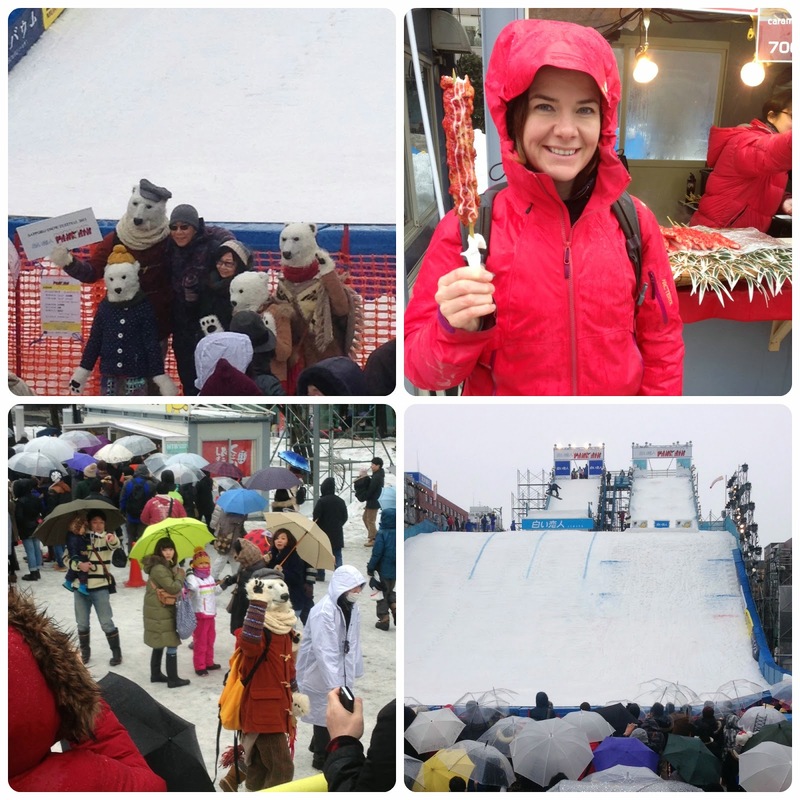 This past weekend, SMS and I went to Sapporo to see the Snow Festival. It's funny that Snow Festival 2015 is here because I remember writing to my co-worker in Summer 2013 to divvy up the 2014 and 2015 trips so that each of us could go during our tour here. I waited until 2015 since SMS would be here. As the date approached, SMS was a little more enthusiastic than I was but I soon warmed up to the idea (ha, ha) because it seemed pretty awesome. I've never been to a festival celebrating a season with huge, transient works of art whether it's in the Summer with sand castles or Winter with snow/ice sculptures. It's an amazing tribute to the process of making art and the act of experiencing it as a duality of a finite object and lasting memory. After sleeping in a bit on Friday and going for a run, SMS and I headed out to the airport. We arrived at our hotel around 5:15 and met up with our friends for dinner at 5:30. We took a taxi over to the Sapporo Beer Garden, which is about 2 miles from Odori Park. Note that it is not the Sapporo Beer Factory- I know that doesn't make sense but trust me, it's a rookie mistake which I may have made circa 2007. We ended up being a group of six and ordered up Jinhisukan, otherwise known as Genghis Khan. It's a delicious dish of lamb and veggies cooked on a large cast-iron dome grill. Unlike some lamb dishes, it's most delicious when cooked to crispiness. When we arrived, we were given plastic bags to place our coats in to shield them from carrying away too much of a lamb flavor from the smoke, but we still smelled like second-hand lamb for most of the evening. This was not a bad thing! Afterwards, we cabbed it back to Odori Park and walked all 11 blocks to see the snow sculptures. The most famous one from this festival seems to be the Star Wars montage, a 50-feet tall, 3,500 ton snow Star Wars-themed Mt Rushmore. It attracted huge crowds and we were part of it! We saw the light/audio show that went along with it and it was pretty impressive. We also saw a huge model of a Manilla cathedral and a beautiful model of the Kasuga Taisha shrine in Nara. More information on the sculptures can be found at this Odori Park link. It was really impressive and we had a great time although we were cold by the end. 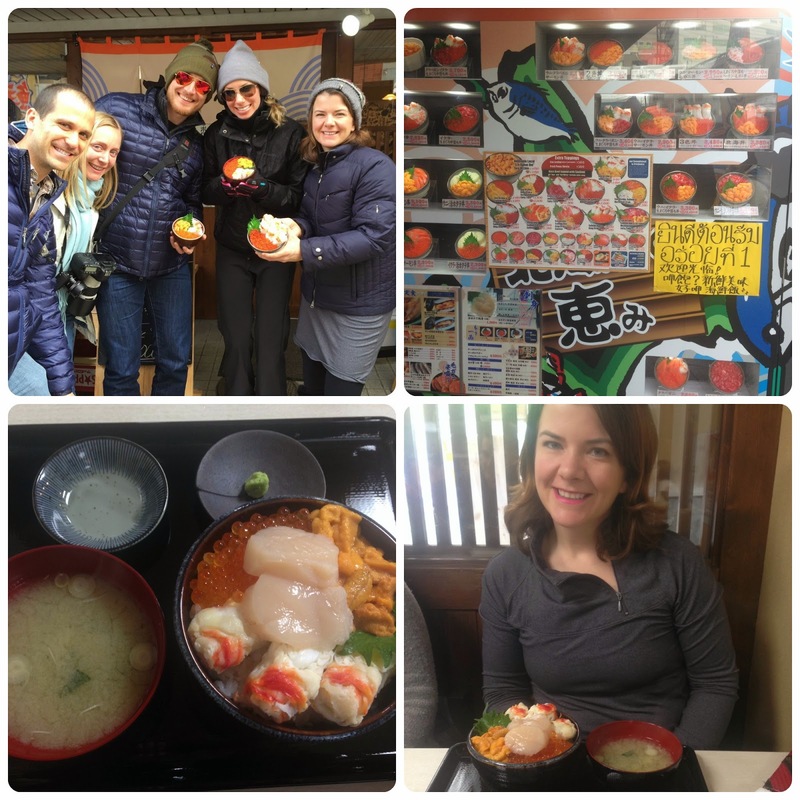 On Saturday, five of us headed for some delicious Hokkaido seafood for brunch. SMS sat that one out since he hadn't been feeling well since dinner the night before. I had a famous uni/king crab/salmon roe rice bowl. It was so good! This dish is a modification of the famous uni-ikura don. We went to Ohiso, a small shop behind the Nijo fish market. The owner was so nice and really helpful. There was a great English menu and we got by with our Japanese although really, the pictures and the resulting food were more than enough for awesome communication! 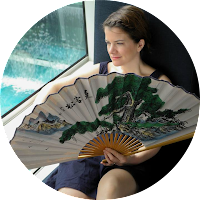 Although there are several restaurants that are similar in the surrounding block, we were so glad we went to Ohiso! SMS and I had a low-key afternoon while he rested up. We left for Sapporo station to head to Otaru, a small town with a famous lantern festival, Otaru Yuki Akari no Michi. We wanted to get there for some golden hour/sunset shots and we're so glad we did. The festival is in two locations, both straight down the street from the train station entrance/exit. 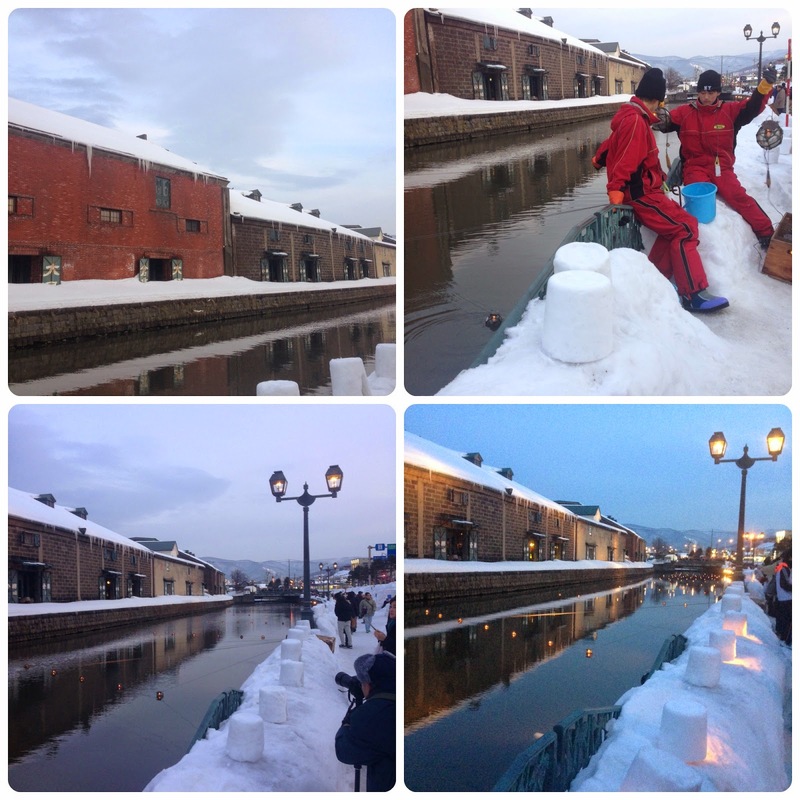 We headed down to the canal, bypassing the Temiyasen Kaijo area with its snow sculptures for the moment. The festival workers were busy lighting the candles and stringing the lanterns into the water. It was beautiful the whole time but the lighting contrasts as the sun went down were gorgeous. SMS got some awesome pictures and I got some ok-replicas from my little iPhone. Our friends met up with us at 5:15 and we walked along the canal and took pictures. We got a group shot in a candlelit heart, as well as some couple shots. After walking along the small section of canal with the lanterns, it was time for dinner. 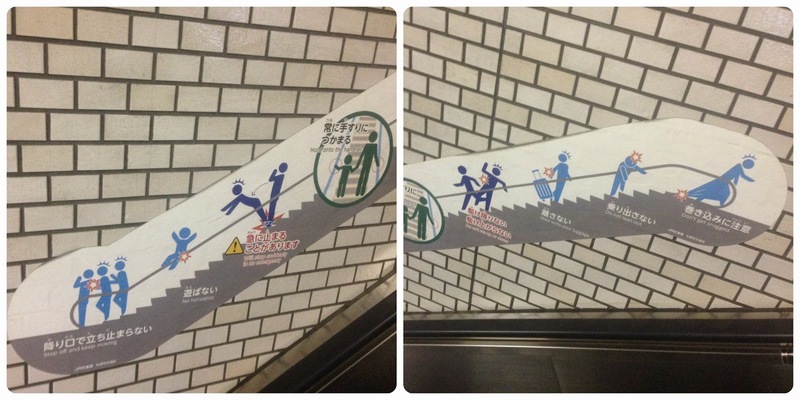 It took a little while to find a place but we ultimately had a delicious sushi meal at a restaurant near the station. By the time we were done, the candles were blown out along the Temiyasen Kaijo, but we walked through it anyway, including a small snow maze. It was very cool. Afterwards, we headed home and parted ways. The next morning, four of us met up and decided that pancakes, not uni-dons, sounded awesome. We searched for a pancake cafe I had found on Google and, very luckily, we stumbled upon a poster for it that told us where to go. 10 minutes later, we were seated at the J.S. Pancake Cafe in the East JR Tower Building, 3F. It was amazing and totally hit the spot. 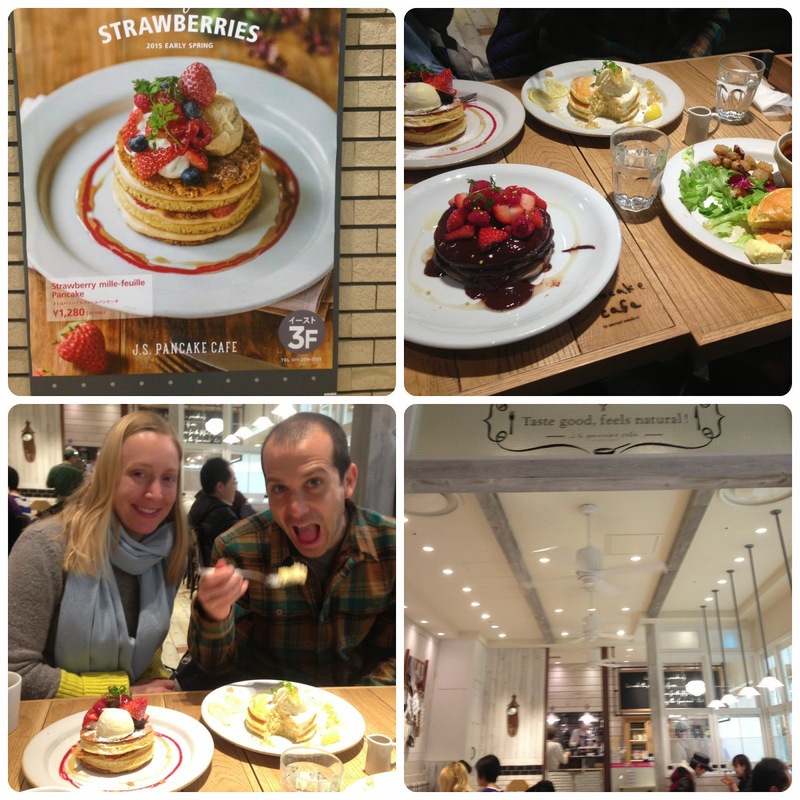 Jeff, Stacie and I shared the chocolate strawberry, lemon ricotta and strawberry mille-feuille pancakes. We each had a different favorite; mine was the mille-feuille with its crunchy inner layers. 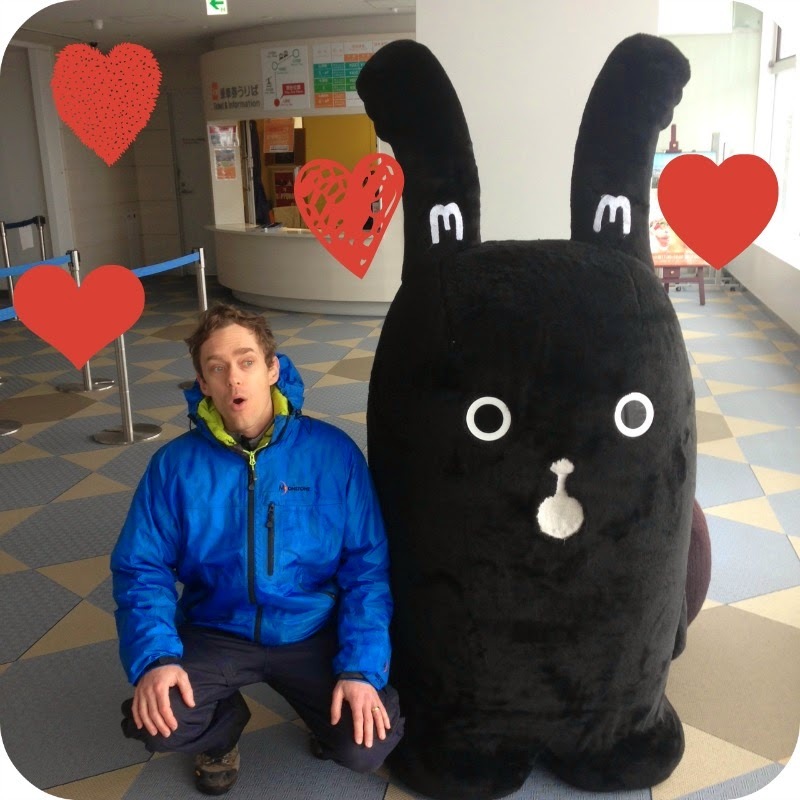 Afterwards, we parted ways as Jeff and Stacie were off to Niseko for skiing. 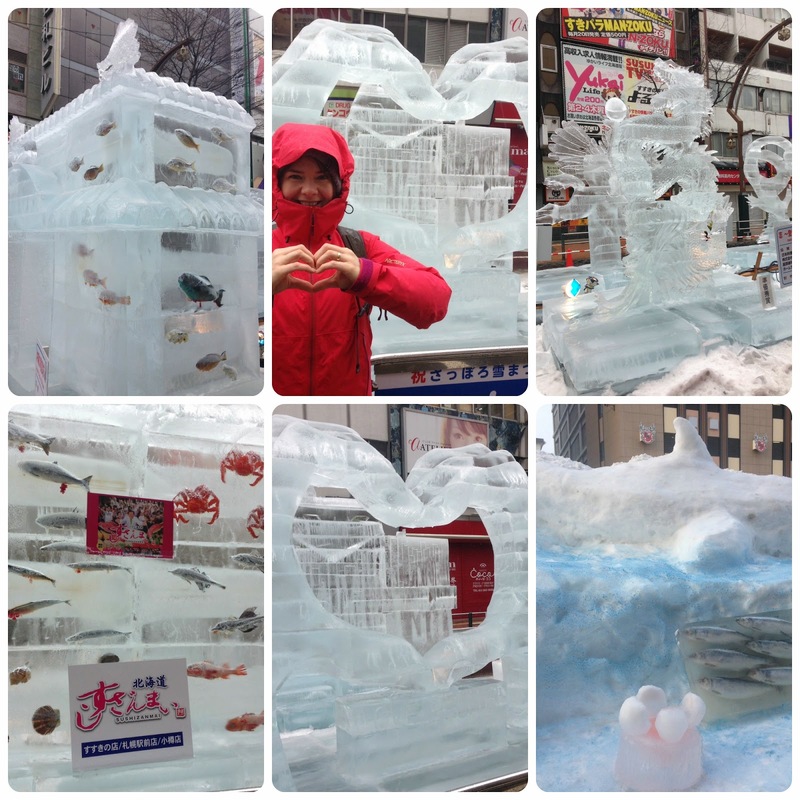 Ice Sculptures in Susukino- note the fish in ice in the left pictures! SMS and I toured around the city. We tried to go to the Mt. Moiwa ropeway but it was closed for winds and "bad view." We wandered around the ice festival in the Susukino section and that was really cool. The ice sculptures were amazingly intricate. There were also a few displays with fish frozen into the ice blocks! Rainy day in Odori! Bears do not like rain! I, however, like king crab on a stick! At this point, it should be noted that it was raining with varying intensity throughout the day. Fortunately, we had our waterproof ski gear so we were ok but the rain was destroying the ice and snow, especially the snow. We went to the International Competition section and several of the snow sculptures had collapsed. The larger mega-sculptures were still holding strong- I hope they continued to through the night! We went to Park Air and saw a snowboard demonstration. Finally, we went to the Beer Museum and had a highly educational experience- we decided we like Sapporo Black Label best! Then it was off to the airport where we had a final Hokkaido treat- soft serve ice cream at the Hokkaido Milk Bar! After dessert, we lounged in the Star Alliance lounge (yay for gold status!) and then got on our flight home. It was a great weekend and I'm so glad I got to experience the festival I'd heard so much about.